In less than a month from now will be Flight SimCon, or Simulation Convention, held in Hartford, Connecticut. These guys are a new gig in town, but they’re showing a great drive to bring pilots and virtual pilots together to better educate and entertain. At Angle of Attack, we wanted to get involved. We were asked to give a presentation during the event. Although we cannot be there in person, we will be Skype-ing in live for this presentation. This will take place on Sunday March 24th at 10:30 AM EST. That’ll be quite early for us here in Alaska, but we are dedicated to contributing to the conference. If you so happen to be in the east coast area, and have the time and means go, we encourage you to do so. Over the years our team has attended such events. From these few short days we have made contacts and started business relationships and personal friendships that have lasted all these years. And to simply be around like-minded people is inspiring. Flight SimCon invites you to join us March 23 & 24, 2013 in downtown Hartford, CT for an all new aviation event. The event will take place in the Bond Ballroom (11th floor) at The Homewood Suites by Hilton downtown Hartford. A few hundred attendees are expected. Flight SimCon will provide a social conference format with networking and learning for enthusiasts of desktop flight simulation programs and aviation in general. If you are a fanatic of aviation or flight simulation of any sort, then you’ll definitely want to make plans to attend. The event is open to the general public as well. There will be tremendous opportunities for networking, education, and growth limited only by one’s own enthusiasm and ambition. Flight SimCon 2013 will feature speakers and exhibitors of software, hardware, and also real world opportunities for training and employment. There will even be an opportunity to climb in a simulator cockpit. View Local Area Network (LAN) Demonstrations. Up to fifteen simulator pilots and controllers will set up their workstations and operate on a LAN network connected to the Boston Virtual ATC server in public view. Recent studies have indicated there will be a massive hiring shortage for new pilots in the coming decades—by as much as 60,000 new pilots needed by 2025. Reports also point out a serious lack of existing training capacity to fill that need. We believe that simulation in general can go a long way towards filling that gap, and Flight SimCon 2013 will focus heavily on how flight simulation pilots can easily transition to real pilots. We believe that the simulator pilot or controller of today can be the working aviation professional of tomorrow. In addition, with the closure of FSX’s GameSpy multiplayer environment, we are presented with a tremendous opportunity to show up in force and help participate in the design of the new “Beyond GameSpy” environment. The future of multiplayer flight simulation in particular may be in flux, and now is the time to rise up and take a leadership role as a community. Multiplayer flight simulation enthusiasts function as an online community, but typically without ever meeting their online friends face-to-face. This conference is also intended to turn what may have been a solitary experience of gaming into a real world opportunity for friendship, networking, learning, growth, and fun. This event is open to the public and is for all ages. Early registration is only $20.00 for 2 day admission. On-site registration is $27.00. There is an optional delicious hot lunch buffet provided by Ann Howard Catering and a “Sky Lounge Event” in the evening with food and beverage and DJ. There is an additional fee for food and beverage events. 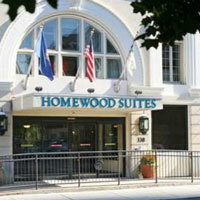 Overnight rooms are available at the Homewood Suites by Hilton Downtown Hartford and at the adjacent Holiday Inn Express both located on Asylum Street. Rooms should be reserved as soon as possible as there are only a limited amount left due to other events in the city that same weekend. For more information please visit www.flightsimcon.com. There are still opportunities for sponsorship, exhibiting, and advertising. For more information please email Info@FlightSimCon.com or call 860.727.0050 office. Try to identify and get some help from AOA members who will be attending. See if they can find space and sit at a small desk with a laptop and demo some of your episodes. Can you imagine some laps doing select groundwork episodes, a couple doing FlightWork. That would be awesome!!! Sure would! As it stands now, we are planning on attending Avsim’s FanCon in May. That’ll be a great time as well.